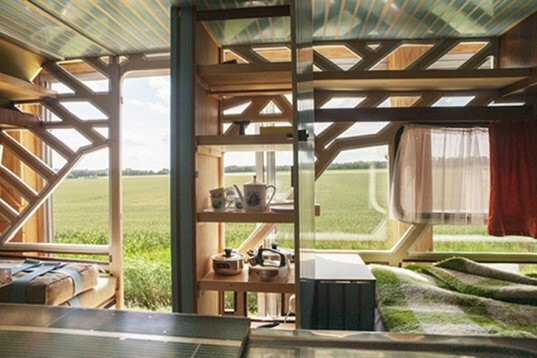 Dutch design studio Makkink & Bey created this tiny Buijtenbed trailer home to serve as a mobile dwelling that can be parked anywhere in the countryside. The unique pop-up guest room is entirely self-contained, and it can be transported by a standard farm trailer. It was created for the Werkplaats Buijtenland project, which challenged designers to create tiny mobile workshops that serve different functions in rural areas. Makkink & Bey’s Buijtenbed is a tiny pop-up holiday home that brings guests closer to nature. It was inspired by the caravans that many Dutch use to go on camping trips in the summer. 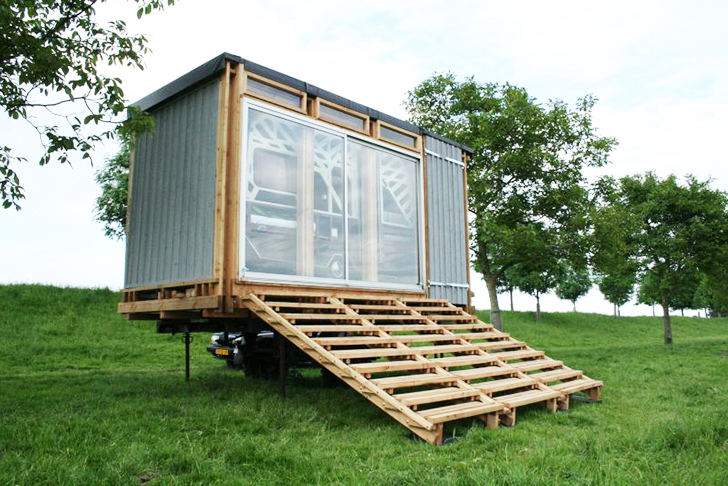 The tiny wheeled shelter is outfitted with retractable wooden stairs, encased in a box, and it can be transported by a standard farm trailer. Buijtenbed was created as part of Ester van de Wiel and Marnix Tavenier‘s Werkplaats Buijtenland project, which also includes a kitchen unit for making hand-made apple juice or cider and a research station for seasonal harvesting. Makkink & Bey's Buijtenbed is a tiny pop-up holiday home that brings guests closer to nature. It was inspired by the caravans that many Dutch use to go on camping trips in the summer. The tiny wheeled shelter is outfitted with retractable wooden stairs, encased in a box, and it can be transported by a standard farm trailer. Buijtenbed was created as part of Ester van de Wiel and Marnix Tavenier's Werkplaats Buijtenland project. The project also includes a kitchen unit for making hand-made apple juice or cider and a research station for seasonal harvesting.